Each program is designed to present information on the recent research in brain development in infants and small children, and the crucial role that early acquisition of pre-reading and reading skills can play in a child’s brain development. This early literacy information hinges on the knowledge that a child learns about reading and writing before they can actually read and write. The programs will demonstrate the six pre-reading skills that parents & caregivers can help children start learning from birth, and activities that parents and caregivers can use to support each skill will be offered. Please inquire at the Children’s Room or call 356-2900 for more information. Besides picture books that can be read to the youngest child, we have a wide selection of board books available for loan. Educational toys, puzzles, and puppets are located in the Children’s Department, where toddlers can play while parents relax in adult-sized chairs. We have CD’s of lullabies and activity songs. AWE Early Learning Bilingual Computers are available even for the youngest patron. Each computer is equipped with 45+ educational software titles spanning seven curricular areas. One of the computers is also located at our Markle Branch. Parents will be able to find many books of interest, from toilet training to parenting tips in our Parent Teacher Collection. They can also borrow magazines such as Parents or Family Fun. Read to Your Bunny is a story time designed for the youngest child along with a caregiver for birth to 24 months. Story Times are held in the Spring and Fall on Wednesday mornings at 10 am for 25-30 minutes. Inquire by calling 356-2900 for registration and more information. Story Times for 2-3 year olds are held in the Spring and Fall on Tuesday mornings at 10 am and Tuesday evenings at 6:30pm for 30 minutes. Caregivers stay with the child for stories, songs and rhymes. Register by calling 356-2900. Story Time at our Markle Branch is offered in the Spring and Fall on Thursdays at 4:45 pm. Even the youngest child is welcome to attend along with a caregiver. Summer Reading Program includes a birth-preschool group. This annual program is held every summer during the months of June and July. As infants and young children listen to books read to them at home, they get to add their names to theme displays in the Children’s Department. A carnival is held at the close of the program where we have a special area for even the youngest children. We enjoy the opportunity to share the EVERY CHILD READY TO READ program to parents and organizations. This program, offered as a workshop, teaches techniques that parents, caregivers, and early childhood educators can use to support the six critical pre-reading skills children can start learning beginning at birth. We also demonstrate and use these skills in our Story Time programs. EASTER BUNNY STORY TIME and STORIES WITH SANTA are both held annually. Call 356-2900 for details and remember to bring your camera. 1,000 BOOKS BEFORE KINDERGARTEN is designed to help parents prepare their children for kindergarten by reading to them. Children ages birth –kindergarten can sign up for this program and receive a reading log with pages for the first 100 books. As you progress in 100 book increments your child will earn prizes and be rewarded by not only enjoying books but by being prepared for when they start kindergarten. Story Times for 3-6 year olds are held in the Spring and Fall on Tuesday and Wednesday mornings at 10 am and on Tuesday evenings at 6:30 pm for 45 minutes. Caregivers are not required to stay, but are always welcome. Register by calling 356-2900. Story Time at our Markle Branch is offered in the Spring and Fall on Thursdays at 4:45 pm. Register by calling 758-3332. Summer Reading Program includes a birth-preschool group. This annual program is held every summer during the months of June and July. As young children listen to books read to them at home, they get to add their names to theme displays in the Children’s Department. A carnival is held at the close of the program. Easter Bunny Story Time, Stories with Santa and a Christmas Extravaganza are held annually. Call 356-2900 for details and remember to bring your camera. Come to the Alphabet Zoo! is a fun time for parents and preschoolers ages 3 and up to explore the alphabet with various activities. It is held 10-10:45 am on the first Thursday of every month at the main library. Registration is a must by calling 356-2900. Kindergarteners can enjoy Story Time held in the Spring and Fall on Tuesday and Wednesday mornings at 10 am and on Tuesday evenings at 6:30 pm for 45 minutes. Register by calling 356-2900. Summer Reading Program includes a picture book and chapter book group. This annual program is held every summer during the months of June and July. As children read books, they get to add to a theme display in the Children’s Department. A carnival is held at the close of the program. Pajama Story Time is held on Tuesday evenings in August at 6:30pm and 7:15pm. at the main library. Each session lasts 30 minutes and participants can wear their pajamas. Sign up by calling 356-2900. 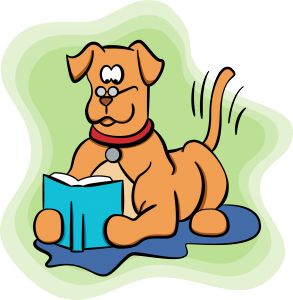 Paws-to-Read is an opportunity for kids ages 6-12 to read aloud to registered therapy dogs in a fun and relaxed environment n Saturday mornings at both the main library and the Markle Branch. Register your child for this program during the months of March, April, October and November. Birthday Party Club is held the last Monday of each month at 4:15pm at the main library and periodically at the Markle Branch. Students in grades 1-4 can each bring a friend and enjoy games, prizes and cake. DISCOVERY CREW is a weekly program for grades 1-3. It is held on Wednesday afternoons at 4:15pm in the Spring and Fall. It is a time for stories, songs and crafts. Registration is required. Tween Scene is an activity program for students in grades 4-6. It meets from 4:15-5:15pm monthly on the second Monday of the month at the main library. Registration is required.